A death occurred at the weekend that left Nigerians in shock. 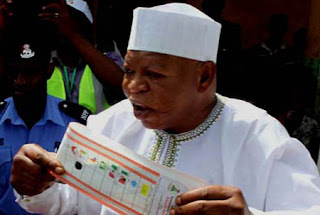 It was the demise of Prince Abubakar Audu, the governorship candidate of the All Progressives Congress in the inconclusive election that took place in Kogi State. Audu’s death came to many Nigerians as a shock. Many also consider the circumstances surrounding his death as bizarre given that he died in the midst of an election in which he was a candidate. Audu was also not just any candidate, he was leading the pack of other contestants until the election was declared inconclusive by the Independent National Electoral Commission. Audu was also on his way to creating a history of some sorts before the grim reaper visited. He had been a two-time governor. He first became governor in 1992 ending in 1993 under the Gen Ibrahim Babangida brief experiment with diarchy. With the return of democracy, he became the first executive governor of Kogi from May 29, 1999 to May 29, 2003. If he had won this current election, it would have been historic. But death has put an end to the ambition. For those who have been monitoring the Kogi election, the death of Audu was indeed unexpected. No one had a premonition of it. Those in his political camp were already celebrating an imminent victory. But like someone remarked when the news broke late Sunday evening, the saying that “man proposes, God disposes” aptly describes the fate that befell Audu. The report of his death though shocking was not an extraordinary incident in itself. Human beings must die either from a natural cause or through an accident. The fact is, people die every day. But the personality whom the grim reaper decides to visit makes the death an event in itself. In the case of Audu, he was a governorship candidate of a party that was coasting home to victory. I have read accounts of the former governor’s death. It was an unfortunate event. But it is not surprising. Audu was advanced in age. His biography indicated that he was born in 1947. This puts him at the age of 68. Audu had also had an eventual life – first as a professional banker and in later years as a politician. Dying at the age of 68 in a country where life expectancy is put at 52 years must be seen as a privilege. But the account of Audu’s death has left me thinking if he was not a victim of negligence and our leaders’ refusal to invest in the health care system in the country. The election was held on a Saturday. Reported accounts of the timeline leading to his death attributed it to shock which might have resulted from his not being declared the outright winner. INEC adjudged the election inconclusive because of reported irregularities in some local government areas. The reports speculated that Audu might have died of shock. Some reports also suggested that Audu might have been disappointed at not being announced the outright winner which eventually led to his health deteriorating health. The All Progressives Congress candidate was said to have suffered a mild stroke on Saturday evening, a situation which relapsed on Sunday just about the time when preparations were being made to fly him to Abuja en route for further treatment abroad. Throughout his ordeal, Audu was reportedly under the care of doctors from the Federal Medical Centre, Lokoja. The circumstances that led to the APC candidate’s death sure raise some questions. But his death should be a lesson to our public office holders and those politicians seeking to lead us. As I have said earlier, death is a necessary end but some deaths need investigating. Audu’s demise is one of such. The APC candidate as a front runner in the election had gone through the rigours of campaign. I strongly believe that his heart gave way from the strain of campaign and the burden of expectations. This is possible for someone who is said to have a history of hypertension. People with a history of hypertension know that the numbers must always be put in check. Exposure to extreme stress such as Audu might have had, has an adverse effect on the heart. This has also left me to wonder why he had driven himself so hard. His health might have suffered at the interval between the campaign and the election. Why for example would a team of doctors be attending to him at his country home? Why not refer him to a proper health facility where he could have the right medical attention. When did his home become a hospital? I have also wondered why after the first reported stroke, he was not rushed to a hospital so he could be stabilised. Why was he still kept in the house? The damage to Audu’s health was done between the first stroke and the second one that turned fatal. It was also reported that his handlers were making preparations to convey him to Abuja where he would be taken overseas, which in itself was scandalous. How could they think of referring an emergency case at such a short notice? What assurance did they have that he would survive the trip? Wouldn’t it have been better to stabilise him first in hospital before further help? What is the condition of the Federal Medical Centre, Lokoja? Why should they be thinking of flying Audu abroad if the FMC is good enough? Is it not possible to have a state of the art heart centre at the hospital that could stabilise a heart patient? Audu’s death is also a lesson for public office holders. There must be a time to slow down. With due respect to the soul of the deceased, was Audu aware that his health might deteriorate due to the rigours of seeking public office? While some people may still be going strong at an advanced age, some may have to retire having served at the highest level. Audu could be said to be in such a category. He had been a governor twice. That was why many Nigerians did wonder at the time he was presented as a candidate why he sought to rule Kogi for a record third. Not that anything was wrong with his ambition; however, his health could now be seen to be a major albatross to his ambition. There are lessons to be learnt. Our leaders must as a matter of urgency invest in our health care system. This whole idea of seeking medical attention abroad must stop. Why are we like this? Why can’t we just do things right in this country once and for all? Every public official is seeking medical attention abroad even for the most minor of ailments like former governor of Akwa Ibom State, Godswill Akpabio, did recently when he travelled overseas to treat bruises he had from a minor auto crash in Abuja that barely scratched his car! Meanwhile, our hospitals suffer massive neglect at home. The irony is that the vicious cycle of neglect will come to haunt us all. Another lesson is that those who seek to hold public office must consider their health first. The strain of public office can but be a burden on one’s health and ability to deliver on the job. Just as we have seen in former President Umaru Yar’Adua, the death of a public official can have implications just as Audu’s demise has thrown up constitutional and succession crises in Kogi. May his soul rest in peace.